Showing results for tags 'omega ruby'. Poke-WHAT Omega Ruby Randomizer Steven Universe Homestuck Hack Something odd is happening in the Hoenn region. Things from other universes are popping into our universe. There are new people and gym leaders, they say they are here for a test. They won't elaborate, saying "The test isn't for you." It seems this anomaly as caused the Pokemon in Hoenn to get their habitats mixed up. We're gathering pictures tune back in for more. I want to stream Omega Ruby gameplay to my computer using NTR to record the cutscenes from the Delta Episode. Unfortunately I don't have any save backups from before I completed the Delta Episode, so I'd have to start a new save file from the beginning. Even if I blow through the main story using genned Pokémon it will take me longer than I really have time for. 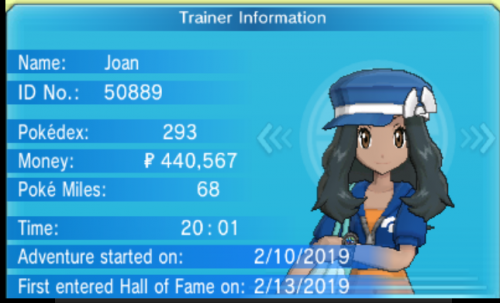 Can anyone here help me out by providing a save that has completed the Elite 4 but hasn't done any of the Delta Episode? Even one with all 8 badges and no E4 completion would be preferable to starting over from scratch. I'll even take one with just 6 or 7 badges. Have QR codes, just need someone to trade them to me. Hi all, this is my first post here and I would like to make a request! I would like to say thanks in advance to anyone who offers help. I can give my friend code to anyone who needs it to trade. Zekrom @ Life Orb Ability: Teravolt EVs: 104 HP / 148 Atk / 252 SpA / 4 Spe Lonely Nature - Bolt Strike - Draco Meteor - Outrage - Focus Blast Arceus @ Life Orb Ability: Multitype EVs: 4 HP / 252 Atk / 252 Spe Jolly Nature - Extreme Speed - Shadow Claw - Earthquake - Swords Dance Genesect @ Choice Scarf Ability: Download EVs: 4 Atk / 252 SpA / 252 Spe Rash Nature - U-turn - Thunderbolt - Ice Beam - Flamethrower Thanks again! Because there is already a Pokemon Alpha Sapphire only hack called GBAlpha Sapphire. I decided to create a hack only for Omega Ruby called Nuclear Ruby. The hack is going to have: new mega (They are going to replace some forms of pokemon that change form with abilities) all moves are randomized all encounters are randomized all trainers are randomized and are harder to defeat no trade evolutions 1 super strong hidden mega edited trainer sprites and models random TM and move tutors randomized level-up moves some Pokemon evolve into Pokemon they should evolve into (but Gamefreak didn't do that) better marts I'm still working on the models and the game text. When you wanna help me just send me a message.